Learn how to make a Candy Corn Tree, a quick and easy Halloween craft. All you need are a few ingredients and about an hour to make this fun and festive decoration. Be sure to check out the photo tutorial with step-by-step instructions showing how to make a candy corn tree. Start by gathering your ingredients. You'll need candy corn, of course--the exact amount will depend on the size of your tree, but for a 12" cone you'll need about a pound, especially if you want to be picky and discard the misshapen candy corns. You'll also need a styrofoam cone form (available at craft stores), hot glue, a flowerpot with a circumference slightly smaller than the bottom of the cone, and some ribbon to decorate the flowerpot. Before you do any gluing, you need to figure out a pattern for the candy corns. They can be arranged vertically, horizontally, or on the diagonal, and you can put them in a variety of patterns. Once you decide on how you're going to arrange them, start at the base of the foam cone and affix each candy corn to the cone with a dab of glue. Glue the candy corn all the way up the foam cone until it is entirely covered. You could also add other Halloween candies onto the tree: packaged single-serving candies in Halloween colors look very nice, and different Halloween candies allow you to create other patterns and textures on the tree. Once the tree is completely covered, decorate your flowerpot however you'd like. The easiest way is to tie some ribbon around the base and affix it with a dab of glue, but you could also paint the flowerpot to go along with the candy corn tree, or add stickers or other decorations. Finally, add a layer of glue all around the top of the flowerpot and firmly affix the bottom of the cone to the top of the pot. 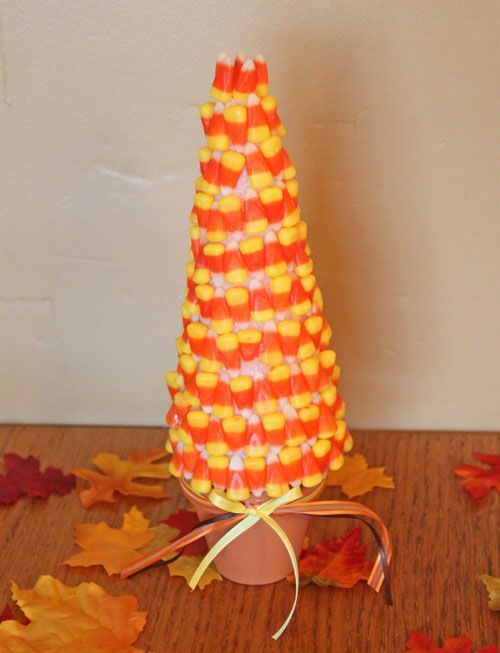 Now you have a great candy corn tree centerpiece! Candy corn tends to get sticky and gooey when exposed to lots of humidity, so if you want to extend its longevity you can brush it with a clear sealant like Mod Podge, which should help keep it looking fresh for many Halloweens to come.